Start your holiday season off with a candlelight celebration like no other! Sip a cup of hot cider as you stroll through historic downtown Swansboro and delight in the streets lined with luminaires, shop windows decorated in whimsical scenes and storefronts adorned with beautiful ribbons and bows. Enjoy live entertainment in the town square and dinner along the Swansboro waterfront. 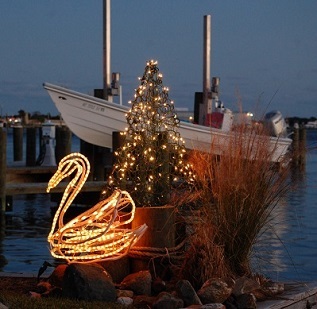 There’s nothing else that will get you more in the holiday spirit than Swansboro by Candlelight! Reserve your stay for the event with Emerald Isle Realty and choose from an amazing selection of Emerald Isle beach vacation houses and condo rentals, all perfectly priced to fit your budget. Book your stay online or call us at (866) 586-6980.